A very useful gear for fish farmers when grading of fish or preparing separate batches for delivery. These small pens (keep nets) are made of strong knotless netting. 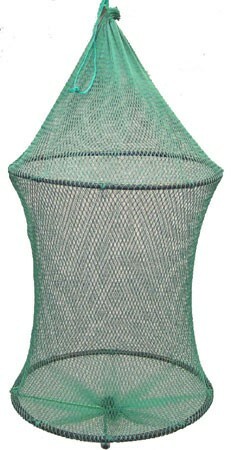 The smooth surface of this net material prevents the fish from injuries of skin and scales. The elastic plastic hoops and a lead weight of 100 gram keep the pen perfectly spread. The draw string has sufficient length to make feeding the fish into the pen an easy task.